When the Seattle SuperSonics relocated to Oklahoma City in 2008, Kevin Durant was the perfect ambassador for the fledgling Thunder. The relocation of the Sonics was met with hostility across the league and Oklahoma needed a smiling face to help reshape their reputation that Clay Bennett had so swiftly and unceremoniously destroyed. Step in the gangly former Texas Longhorn with the silky smooth jump shot. Durant’s humble and friendly nature was vitial to the Thunder during their establishment. His smiling face and respect for his opponents helped the Thunder’s transformation from league villains to one of the most successful and popular teams in the last five years. However, with their reputation and popularity now secured, OKC and Durant have bigger and better goals to aspire to. Mainly winning the franchises first title in their new home. But as Durant discovered in the Finals against Miami, being the hero does not guarantee you success. So, last season, KD changed his approach to the game. 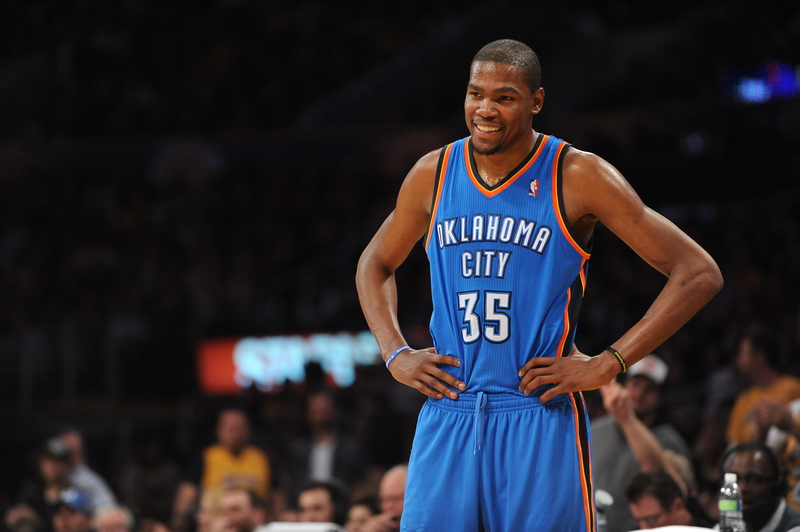 Throughout the first five years of his career, Durant was always one of the leagues brightest and most talented stars. His body type and skill set was unlike anything the league had seen before – mixing the size and shooting of Dirk Nowitzki with the quickness and handles of a guard – and he developed into one of the leagues biggest match-up nightmares. What made Durant truly unique was how he played without an ego. He would routinely destroy defenders on the court, but off the court he was a true gentleman full of praise and respect for his opponents. Unblemished by off court misadventures or egotistical trade demands, Durant was the leagues perfect poster boy. However, once the Thunder came up short again Miami in the Finals, critics began to find imperfections in Durant’s previously untarnished armour, and many claimed he didn’t have the killer instinct and drive required to push his team over the top. He was too friendly to win. Unbeknownst to the league, Durant did have that killer instinct and ego, he just kept it under wraps like his tattoos. It started with a push on Demarre Carroll, then evolved into $25,000 fines for demonstrative gestures and culminated in his first ejection from a NBA game, but it was clear from the start of the season; Kevin Durant was not the choirboy he used to be. Durant had always been a star – In his short time in the league, he won; Rookie of the Year, earned four All-Star selections, four All-NBA First Team honours and three scoring titles – but he had never shown the cold-blooded instincts of some of the leagues other greats. Last season, Durant took his game to the next level. He had always been a prolific scorer, but now he was dominating his opponents. He had always been a great jump shooter, but he turned himself into a member of the 50-40-90 club. He was always a great finisher (ask Haywood), but he became an emphatic finisher (ask Asik, ask Gortat, ask Hibbert, ask all of LA). But just like Michael found out against the Pistons and LeBron realised in Cleveland, when Russell Westbrook blew out his ACL in the first round, Durant discovered you can’t do it all on your own. This summer, Durant didn’t ease up on his newfound darker side, he dropped a mean 63 points in his return to Seattle at the Jamal Crawford Pro Am, disrespected Fenerbahce Ulker in the preseason and wouldn’t even ease up against children at a basketball camp. Entering this season, Durant is going to need to be more ruthless than ever. You cant dethrone the King with smiles and fist bumps. For the first time since the team moved to OKC, Durant wont have Russell Westbrook by his side, and with the untested Jeremy Lamb the only other scorer on the roster, Durant will need to shoulder more of the load than he ever has before. Durant’s fans might think his new persona makes him the Batman of the league, giving the NBA what they need – potentially a new MVP and Champion – but not necessarily what they want – a poster boy. But while he says he is “tired of being second”, and may win his first MVP and first ring by the end of the season, for now he will still have to play the Robin to the next man on this list. I like your site. Good stuff. I’ll be following your blog. Keep up the good work.